Tickit On Demand is aligned with ISO 31000, the international risk management standard. 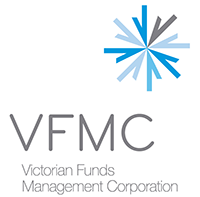 You can create a risk management plan by identifying and assessing risks, and implement tasks and action plans to manage them. Risks can be assessed in any part of your organisation, and flexible scheduling allows them to be assessed at a frequency that best suits your organization. Tickit On Demand provides a responsive and robust solution for management of your compliance related to laws, regulations, standards and policies. 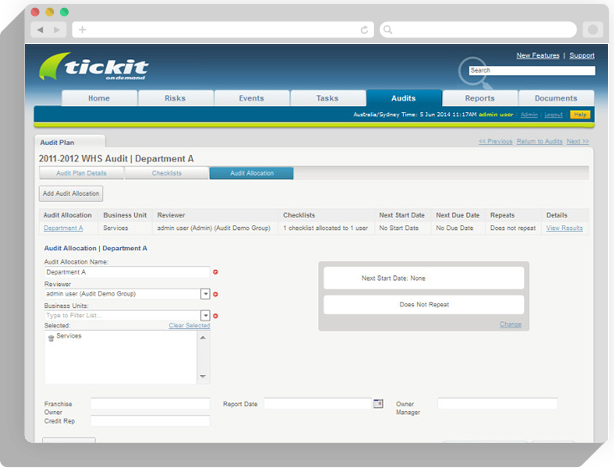 You can set up action plans to remediate compliance issues efficiently and link reference documents from your intranet, external websites or even upload them to your Tickit system. 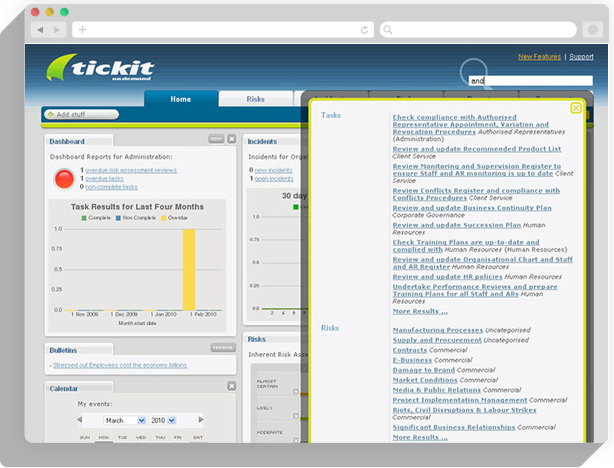 Tickit On Demand has the most comprehensive and flexible Incident Management solution available. The Incident Management module includes form creation, workflow, alerts, notifications, access control, diary notes and reporting. 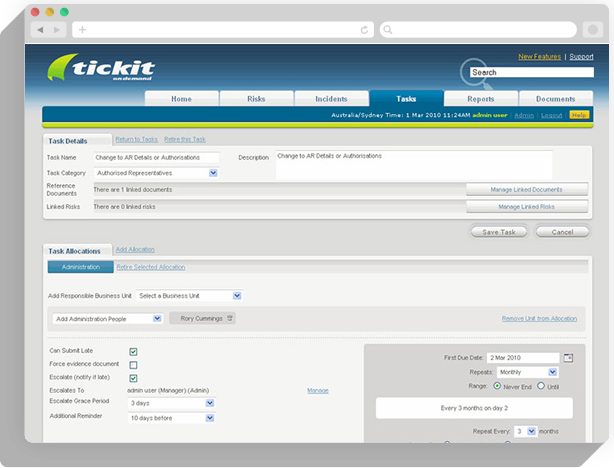 Tickit Audit allows you to efficiently and effectively manage the entire audit cycle. 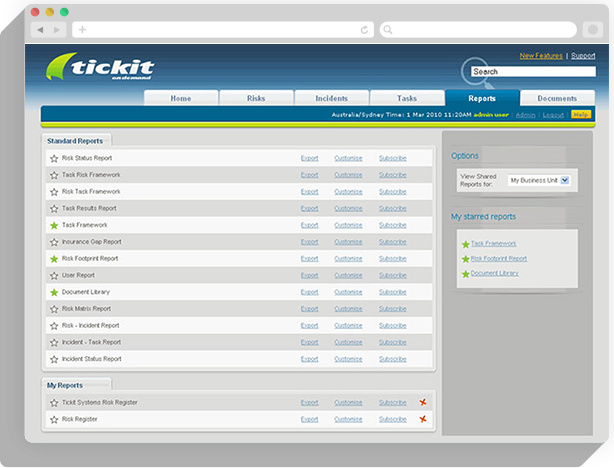 The Audit module is fully integrated with the Tickit Risk, Compliance and Incident modules, enabling comprehensive tracking and reporting of Audit results. The new Question Bank greatly simplifies the Audit preparation process. Tickit On Demand has allowed us to centralise our risk, compliance and incident reporting across our diverse operational divisions. The system is continually providing benefits with its easy to use interface for staff and the ability to generate reports and filter relevant information throughout the organisation. The Audit Committee has stated on two occasions that Navitas risk management capability has raised a level or two and Tickit On Demand has played an enabling role in this.